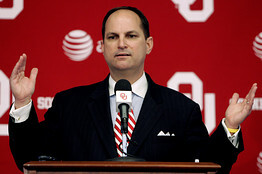 Linking Up: Now It's "Joe Castiglione to Michigan"
*Dennis Dodd of CBSSports.com offered up some "pure speculation" in his column yesterday that Oklahoma athletic director Joe Castiglione could replace outgoing Michigan AD Bill Martin this summer. I don't see it happening. *Speaking of the Wolverines, Michigan President Mary Sue Coleman's articulation of her position on head coach Rich Rodriguez, which was issued through a subordinate Sunday, shouldn't instill confidence in the new regime: "The president remains supportive of the coach." First of all, does anyone actually talk the way athletic departments word these statements? It's like they write them in Japanese first and then ask someone to translate it. Second, it sounds to me like the Michigan administration is hedging its bets in case the investigation into RichRod's practice policies turns sour. If so, expect the president's support to no longer remain. *Blatant Homerism contributor Bryan Waters writes that the Sooners had the alliterative look of a "slowly sinking superpower" against Texas Tech last weekend. Maybe so. Or maybe they looked like a team that is suffering through a god-awful stretch of injuries. Who knows? Such observations may look awfully prescient this time next year, but I think it's premature to go to such lengths yet. *Sad news out of Raleigh regarding North Carolina State offensive coordinator Dana Bible. *Great all-access profile of Notre Dame coach(-for-now) Charlie Weis on the day after the UConn loss by Fanhouse writer John Walters. I had actually started to talk myself into the idea that Weis would get another year in South Bend, mainly because I'm not sure if the Irish can lock up the kind of can't-miss candidate the program needs at the moment. He sure doesn't sound in this article like a guy who'll be staring up at Touchdown Jesus on Saturdays in 2010, though. *Dr. Saturday gives an argument for why TCU would be getting the shaft if the current BCS standings hold form. In actuality, the good doctor's main point isn't that TCU is more worthy than a team like Florida. Instead, he's using the comparisons between teams that will likely be left out of the title game and those that will be included to illustrate the inconsistencies of the current system of declaring one team "the best" in college football. My question: Would anyone feel a little squishy about the outcome if Oregon was to win a college football playoff this year?